With keen interest in science, Joshua Lawrence, 13, continues to make his family proud in many areas despite challenges. According to his family, he is a child who continues to fight and win the odds against the Autism Spectrum (PDD/NOS). 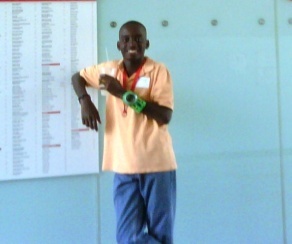 Lawrence has not allowed his challenges to peg him back, as he recently participated successfully in a summer science program at a University in Rhode Island, USA. Lawrence was among some 105 7th and 8th graders from various countries, including the USA, UK, South Korea and China. He was the only child from the Caribbean who attended the prestigious SPARK Summer Science Program at the ivy league Brown University in Providence, Rhode Island last month. Lawrence of Sugar Mill Road, Lower Estate is an 8th Grade student enrolled in an accredited high school in Florida and he is a continuing student of the Sylvan Learning Center, Caguas, Puerto Rico and associated with The Valley Day School, Virgin Gorda. Lawrence's success and achievements are commendable, as it cements that every child can learn to his full potential. However, according to his mother, Einstein Samuels, this cannot be achieved without getting the proper intervention that the child requires. She believes that early and continuous intervention is the key. She encourages parents like herself to be aggressive and not allow any system or educator to contribute to their child's downfall. She is of the view that the time has long expired for educators and policy makers in the BVI to ensure that no child is left behind. Meanwhile, in relation to the program, among the many interesting programs to choose from, Lawrence chose Nanotechnology: The Small Wonder From Atom To Space. The experience and knowledge he gained will long be remembered as Lawrence participated in classmate presentations and a debate on whether or not nanotechnology should be used for medical applications. Among the exciting experiments and hands on learning, he made an edible nano surface of candy and crackers, water filtration using nano size calcium phosphate and bone cement using jello and nano size bone mineral. The teenager also measured the pulse rate of a blackworm, which he didn't like too much. Professor Yei Yang who taught the class, said Lawrence was able to meet the demands of the program and he was impressed with his performance and participation. As a result, Lawrence's critical thinking skills have advanced as he is now able to view scientific and real life situations from different angles. He has a greater appreciation for science, which has widened his curiosity to learn more and ask more mind-provoking questions. According to his family, above all, he made lots of friends and he is thrilled that learning doesn't have to be boring. In addition to his interest in science, the teen loves traveling; plays the violin, guitar and drums; kung fu, sailing and he also loves challenging himself to use the piano. 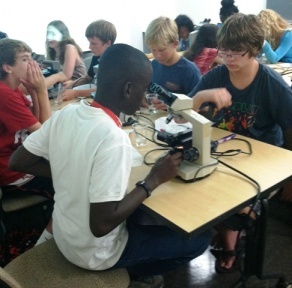 SPARK is a science program for curious middle school students that seek to spend one or two weeks at Brown University campus and immerse themselves in exciting science subjects and gain the foundations necessary for further scientific inquiry. SPARK brings together students with similar abilities and diverse backgrounds. Applications are submitted and reviewed by the Admissions Committee who looks for academic excellence, intellectual curiosity and the ability to participate, and thereafter approve or reject applications. Supporting documents for the application included official school transcripts for the 6th and 7th grades with an explanation of the scoring system. The program was introduced to Lawrence by his school. It’s a really a great publish, I received some vital details these extremely valuable for me and my small business. If you have more relative details than remember to share with us.online certification.